This is a true Sanjeev Kapoor's recipe and is the second time i have made this dish for a party. It has been truly enjoyed in both instances. The aroma and flavours of the biriyani is lovely, the blend of whole spices and fresh coriander and mint leaves makes this dish special. When in Bangalore i picked up a series of Chef Sanjeev Kapoors books from a road side seller on 100 ft road, Indiranagar. I paid 80 rupees for 6 small books way back in 2002. I have definetely got my monies worth with his classic recipes collection as I like some of his recipes and use them frequently for parties. 1. Bring four cups of water to a boil in a thick-bottomed vessel. Add bay leaf, cloves, green cardamoms, black cardamoms, cinnamon, mace and one teaspoon salt. When the water starts boiling rapidly, drain the soaked basmati rice and add. 2. Cook for eight to ten minutes, stirring frequently or until the rice is three fourths done. Drain in a colander. 3. Heat oil in a non-stick pan, add sliced onions and stir-fry over high heat for two to three minutes or until the onion turns translucent. Add ginger paste, garlic paste and sauté briefly. 4. Add red chilli powder, coriander powder, crushed peppercorns, cumin powder and turmeric powder. Stir-fry briefly and add the pureed tomatoes. 5. Continue cooking over high heat for another two to three minutes, stirring continuously or until masala is fairly thick. 6. Add the whisked skimmed milk yogurt, garam masala powder and half the quantity of chopped fresh coriander and mint leaves. Stir well and cook for two minutes more. 7. Add the quartered button mushrooms and salt to taste. Stir-fry over high heat for two to three minutes and remove from heat. 8. Arrange the cooked rice and mushroom masala in alternate layers in an oven proof dish (or Biryani handi), sprinkling the remaining chopped fresh coriander and torn mint leaves, kewra water and saffron dissolved in skimmed milk after each layer. Ensure that the top most layer is of rice. 9. 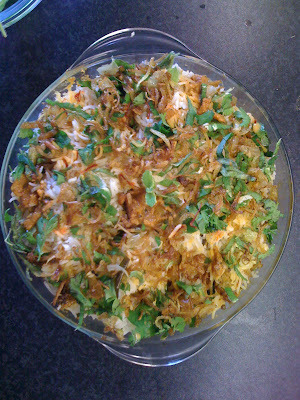 Cover the assembled biryani with a tight fitting lid and seal the edges with kneaded atta dough (if required) if posible. I used foil to cover my dish and then placed a lid over. 10. Place the sealed dish in a preheated oven at 200C for fifteen to twenty minutes. Open the biryani, just before serving.